Abbotsord – Friday night in Abbotsford saw the Pilots (24-11-1-1) fall by a score of 6-2 to the visiting Delta Ice Hawks (25-7-2-3). The loss saw Abbotsford snap a nine-game home win streak dating back to Nov. 2nd. 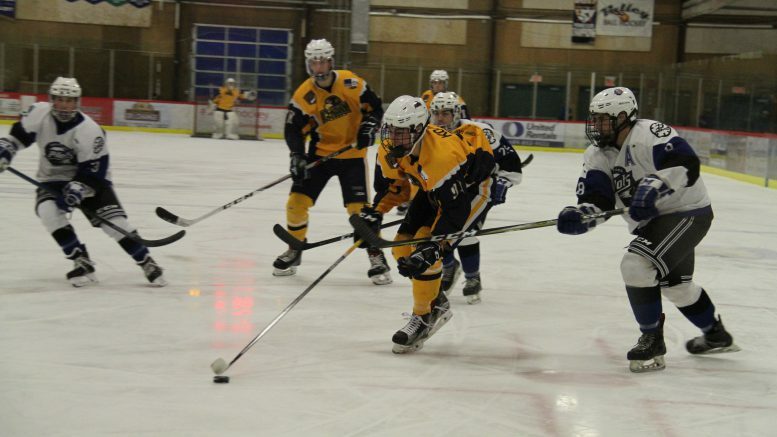 Ice Hawks captain Jordan Deyrmenjian led his team with a goal and two assists while Pilots captain Baylee Wright notched an assist on the night. Jordy Engleson earned the win in goal for the Ice Hawks turning aside 22 of Abbotsford’s 24 shots while Keaton Dyck stopped 29 of 35 fired from the Delta Ice Hawks. Delta came out of the gates with speed as Daniel Rubin opened the scoring at 8:40 of the 1st, assisted from Jordan Deyrmenjian. The two Ice Hawks swapped roles over four minutes later as Rubin had a helper on a goal from Deyrmenjian on the power play at 12:00. Ice Hawks led 2-0 after 20 minutes with the shot total being 12-6 in favour of Delta. The Ice Hawks kept going, extending their lead to four in the first five minutes of the middle frame. Jake Dowell and Liam Visram had helpers on a goal from Jordin Kojima at 2:15, then Deyrmenjian fed Alex Suprynowicz at the 4:16 mark. It was the second power play marker for the Ice Hawks. The Pilots did break Jordy Engleson’s bid for a shutout as Will Hazell-Penaluna tipped in a Baylee Wright shot on the power play at 7:45 to cut at Delta’s lead. However, Seamus Collins assisted Jihwan Kim at 17:28 to restore a four-goal Ice Hawk lead. Shots on goal in the second period were 15-10 Delta. Wasting no time after the intermission, affiliate player CJ Christensen netted his first goal in an Ice Hawks uniform at 4:02 of the third. The Pilots were quick to respond as two rookies connected for a tally, Sen McCracken from Mason Smith at 4:26. Tempers did flare in the late stages as Ethan Willoughby of the Pilots and Nick Marsh of the Ice Hawks were both sent off with misconducts at 16:56. Shots on goal in the third were 8-8. 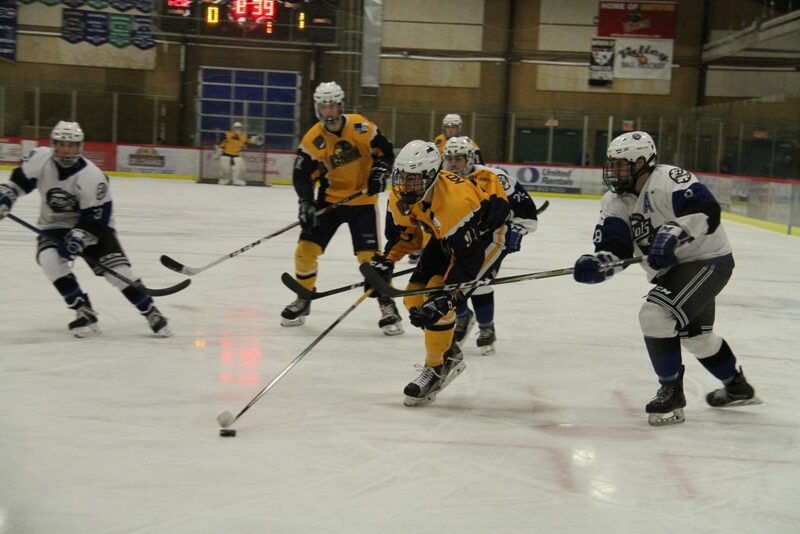 Next Pilots Game: Wednesday in Langley against the Trappers at 7:00 PM. As the final meeting of the season between the two teams, Delta sweeps the season series against Abbotsford with four wins. With an assist tonight, Baylee Wright is now the Pilots franchise leader in single season assists with 65. He surpasses Brock Curries previous record of 64. Overall, Baylee Wright sits at 109 points on the season and is 13 points away from the PJHL single season point record of 121. Earlier this week, three Abbotsford Pilots were named to the PJHL Prospects Game. Ethan Willoughby, Mason Smith and Will Hazell-Penaluna will represent the Harold Brittain conference on January 28th in White Rock. Ice Hawks forward Jordin Kojima (centre, yellow) escapes a hook from defenceman Justin Peaker of the Pilots Friday night at MSA Arena. Be the first to comment on "Abby Pilots Home Streak Snapped By Delta"